Seaford was a ‘rotten borough’ in the past with such distinguished MPs as William Pitt the younger and George Canning representing the town in Parliament. 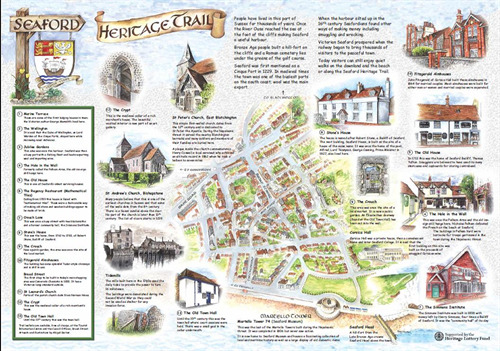 We were also a Cinque Port but the exact date when we were so designated is not known, but as early as 1229, in the reign of Henry III, mention is made of Seaford as the chief of the Subordinate Ports and limb of Hastings, its Mother Port. Seaford UDC which was established in 1894 and which ceased to exist in 1974 when it was merged with Newhaven UDC., Lewes Borough and Chailey RDC to become Lewes District Council. No Parish or Town Council was created in Seaford because the Town at the time could only be served by two parishes and not one as we have it now and the Councillors of the day decided not to proceed with Parishes. There are indications of stone-age occupation in the area, an Iron Age Fort and Roman burial ground on Seaford Head and very importantly, the first written evidence of Seaford coming from the Saxon occupation in the fifth century. There was the period from the beginning of the 13th century when Seaford became a Cinque Port and was the chief of the subordinate ports and limb of Hastings, its mother port. As you are aware it was because Seaford was a Cinque Port that in 1298 it was granted the right to send two Members to Parliament. This had such a great influence on the political and social history over the next 500 years until the Reform Act of 1832 withdrew the honour of a parliamentary representative, the last one being Mayor Lyon. The first Local Government came about in 1544 when Henry VIII granted a Charter which allowed the Town Parish and Borough status and to be more or less self-governing with its own Corporation which lasted until 1883 when it was replaced by a Local Board which itself was quickly replaced in 1894 by the Seaford Urban District Council which in turn ceased to exist in 1974 when it was merged with Newhaven UDC, Lewes Borough and Chailey RDC to become the Lewes District Council. On the 1st April 1999, by order of the Lewes (Parish) Order, the Parish Council of Seaford was formed and at a meeting of the Council on 18th May 1999, it was resolved to change the status of the Council from Parish to Town and therefore the creation of Seaford Town Council. 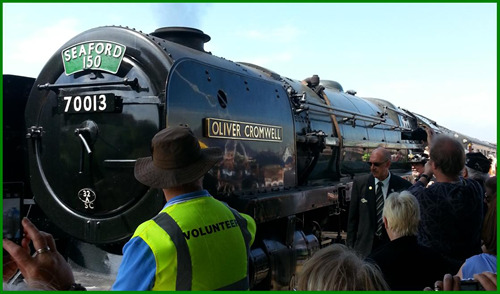 Picture: 'Oliver Cromwell' steam train coming in to Seaford on the 150th Anniversary of the Seaford rail line.